23:00 Finish dinner, adjourn to the bar for refreshments. You are asked to tick each section of the dinner, if you are bringing a friend/Wife or Partner you will be required to fill in a separate Menu sheet, (enclosed) Coffee and Mints are part of the meal but if you require them please tick. We will be using a Table plan for the Waiters/Waitresses so please ensure you order correctly and sit in the correct seats to avoid confusion on the night. The Wines and Ports are supplied by Ashley Scott Wine merchants and they will be supplying a House Red/White and a Port wine. Glasses will be placed on the table for each Wine, there is no requirement to order any particular wine as they will be placed on the table prior to the meal and available throughout on a table close to the Banquet Tables (you will, unfortunately, be required to pour your own wines, the caterers will only serve the food. I do not have to remind you that the figures have been worked out on a specific number of members attending, we require all members to return their forms + Cheques/Postal Orders (Made Payable to the Broadsword Association) as soon as possible. If we do not reach the specified number there may be an additional charge but at the moment this is not envisaged (Forewarned is forearmed). Steve Bullock has asked the committee to advertise an informal get together in Guzz on the above dates. We all know that the question of a Mid term reunion was mentioned at the Chester AGM but this is a (one off), it is not official, but if you wish to attend please contact Steve Bullock ONLY and not the committee! He will do all the bookings for you. There is one small problem says Steve, The hotel, which is the Imperial Hotel on Lockyer Street can only take 22 couples! So get your orders in quickly or stay somewhere else! The Broadsword Newsletter has currently been up and running for 4 years and it is only now that we have so much material to publish I have decided to use half of it now and the remainder for the November edition. On this edition we will concentrate on the Reunion details. There is also a new standing order form for you all to see and we would like you to fill it in and get it started as soon as possible, it will save the Association a lot of money in the future if everyone was paying affiliations by Standing Order, this is of coarse to come in line with your wishes at the AGM in Chester when you all asked for the bank details for payment by the above method. As you can see there is also an attendance form to fill in and post off to me as soon as possible, when you are organising an event there is never enough days to get it all done. On the next Reunion we require exact details of who is arriving, as we have a lot to organise to make it run smoothly, please send your forms off with all the details asked for, along with your menu order forms to me. I need all of those details before I can start ordering anything. Please remember, if you say you are attending you will need to pay up front, both your affiliation (Standing Order) and the cost of the meal. Also at the last committee meeting we have taken on your thoughts and wishes and have decided that the next Reunion (2002 Dinner) will be the last one in Chester for a while! Some of the ideas for venue's were Bournmouth and Torquey, both of which have already contacted us through our connections with the Navy News and the Royal Naval Association. Let us know your thoughts ! we do listen ! They will be brought up at the next AGM and discussed at length. At the last committee meeting we discussed the possibility of getting our own "Rum Fanny" with our name on it and a Ceremonial Lifebelt, we are trying a couple of outlets to see if this is viable, we will keep everyone informed of any developments but if you have any ideas let Keith know as soon as possible. One important note to mention is that Keith (Secretary) has informed the committee of hit intentions of stepping down as Secretary at Chester in 2002. There were many reasons which have been explained to the committee and they have expressed their sorrow that he has to go. Terry said Keith had been the driving force for several years and would be sorely missed by the Association. By Ed I will still be at the Reunions ! Socialising and enjoying myself like the majority of you. If there is anyone out there that fancy's a go in th edriving seat don't hesitate to put your name forward for Election. That includes the Committee. Thank you for my members card received recently, unfortunately I will not be able to attend the reunion at Chester. I hope all goes as well as it did two years ago, I do know it is because you and Tansy have kept a steady hand on the tiller that it will be supported this year. 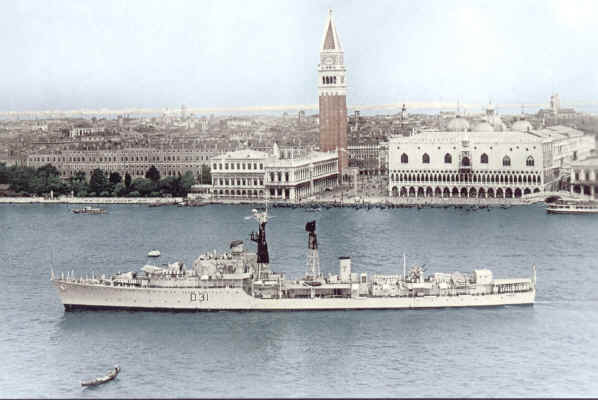 The enclosed photo (original black and white) one of Broadsword entering Venice on Monday 4th July 1960. We had just done a six week patrol around Cyprus so the holiday atmosphere at Venice was much enjoyed by all during our four day stay. I send my best wishes to all attending and hope I will be able to attend the next reunion, be it at Chester or elsewhere. Thanks for an excellent reunion in Chester. Being my first reunion it was just unbelievable seeing the faces I haven’t seen for 18 years, I had a great time and I am already looking forward to the next one in 2002. The web site was first uploaded in December 1999 and in the first year received 34,000 page hits. I receive lots of emails from other units that were down the Falklands even including Argentinean pilots (wanting to know which ships they had attacked?) see enclosed photo. The site is based on the Falklands war booklet with content from the ships company plus other things that I had in my shoe box. Any other content that anyone has would be appreciated to keep the site with updates now and then. If you have pics not on the site please mail or email them, everything will be sent back. 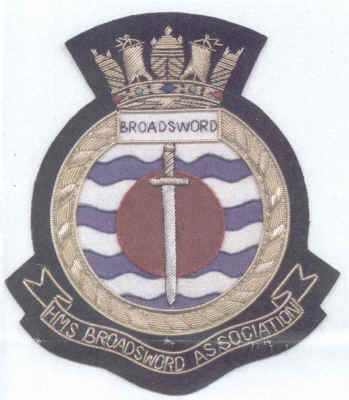 The broadsword Association site has just been set up at. Memories associated with any of the Broadswords. Again any content for this site would also be appreciated. 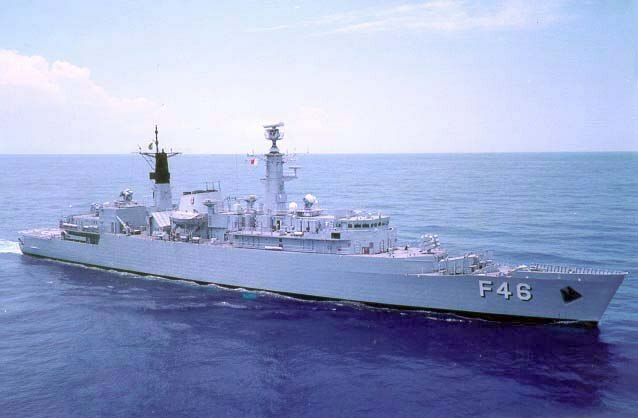 HMS Broadsword was sold to the Brazillian Navy in 1995 together with Brilliant, Battleaxe and Brazen shortly after. 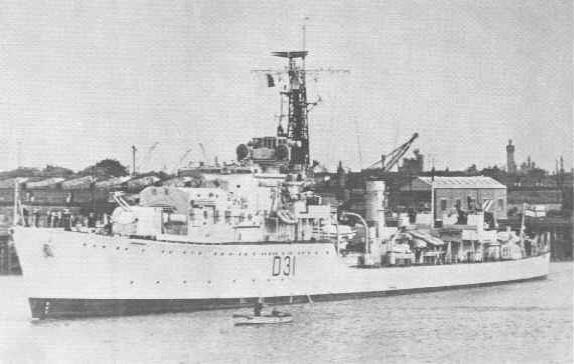 The name "Greenhalgh" was given to the frigate in honor of Ensign Joao Guilherme Greenhalgh, a Brazilian hero and martyr. Ensign Greenhalgh was born on June 28, 1845, in Rio de Janeiro, Brazil, and unfortunately had a very short military career in the Brazilian Navy. He died, fighting, on June 11, 1865, at the age of only twenty, during the "Triple Alliance War" which involved Brazil, Argentina, Uruguay and Paraguay, amid the Riachuelo Naval Battle, which was won by the Brazilian fleet in the waters of the Paraguay River. In that event, the Brazilian Ship Monitor "Paraiba" was accosted at the same time by three enemy ships. The crew (Ensign Greenhalgh included) on board the Brazilian ship engaged in a bloody fight against attacking soldiers and sailors, who outnumbered them by three. Greenhalgh stood out by his bravery in the fight. As his final battle, he fought against a much larger number of enemies who tried to strike down the Brazilian flag from the ship's mast. He ended up with his head decapitated, but the flag remained up and flying. P.S theres some stuff on disk if you can handle it!